Come on, that’s not really “lost”. Photo by méline.ch on Flickr. Mark Zuckerberg has no plans to run for president, the Facebook founder and CEO told BuzzFeed News Tuesday. “No,” Zuckerberg wrote in response to a question asking if he had any plans to run for president. “I’m focused on building our community at Facebook and working on the Chan Zuckerberg Initiative,” referring to the limited-liability corporation he and his wife, Priscilla Chan, founded in 2015 to advance human potential and promote equality through major bets in education and science research. Zuckerberg did not immediately respond to follow-up questions about whether he’d explicitly ruled out a run. Give it a decade or two. What I did not know, as a tech reporter, is how tricky it is to actually live a connected life inside a federal courtroom. Federal courts have rather strict rules around electronics and recording devices inside courtrooms, the laws of which go back much further than some of the software and services we use to broadcast news today. In 1994, for instance, a Judicial Conference Report declined a recommendation for expanding the use of cameras in federal civil cases, citing concern for the intimidation of witnesses and jury members. Even as far back as 1960, Supreme Court Justice William O. Douglas argued against broadcasting of trials. “It is not dangerous because it is new,” he wrote in a paper published in a law journal at the time. “It is dangerous because of the insidious influences which it puts to work in the administration of justice.” It is often policy for district court judges to determine their own policies around electronics and broadcasting — even with tweets. Even more difficult in UK courts. Bail hearings, for example, aren’t public – there are only very limited things you can say from them. Apple’s AirPods are wire-free, which makes them convenient to use, but it’s also caused some concern from users who are afraid to lose their $159 earphones. In its latest beta, Apple has introduced a new feature to assuage customer fears – Find My AirPods. 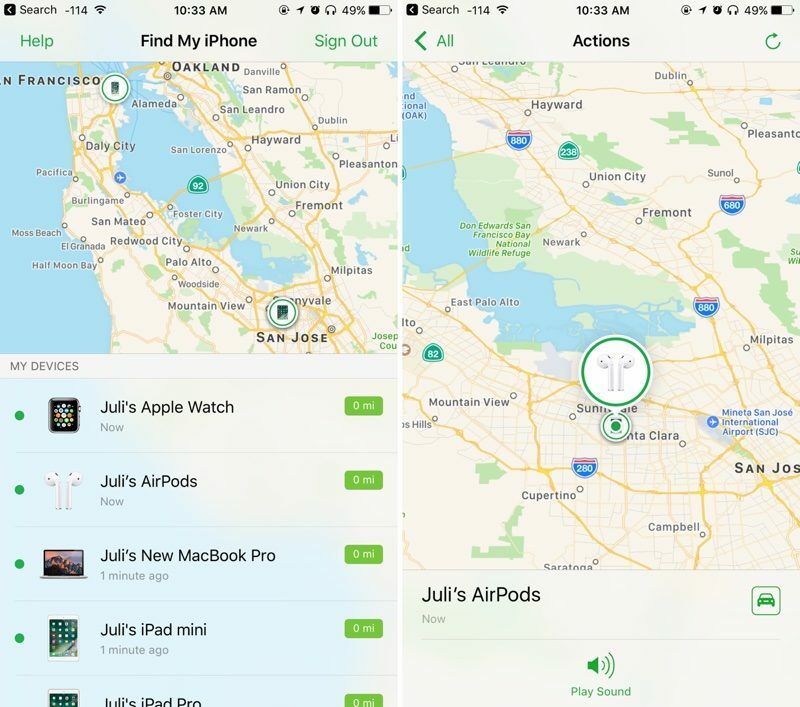 Available in iOS 10.3, Find My AirPods adds your AirPods to the “Find My iPhone” app, listing them alongside all other Apple products. In the app, you can tap on the AirPods to cause them to play a little chirping sound that gradually gets louder for location purposes. After activating the sound, you can choose to have it play solely through the left AirPod or through the right AirPod so you don’t need to listen to chirping if only one of the AirPods is missing. Clever. Though I haven’t managed to lose mine yet. (The “find iPhone” function on the Apple Watch is great.) Not sure about their being located on a map. I mean, really? There are big AI perception challenges, just in my neighborhood, to get driverless cars to interact with people as well us driverful cars do. What if level 4 and level 5 autonomy self driving cars are not able to make that leap of fitting in as equals as current cars do? Cars will clearly have to be able to perceive people walking along the street, even and especially on a snowy day, and not hit them. That is just not debatable. What is debatable is whether the cars will need to still pass them, or whether they will slowly follow people not risking passing them as a human driver would. That slows down the traffic for both the owner of the driverless car, and for any human drivers. The human drivers may get very annoyed with being stuck behind driverless cars. Driverless cars would then be a nuisance. In the little side streets, when at a stop sign, cars will have to judge when someone is about to cross in front of them. But sometimes people are just chatting at the corner, or it is a parent and child waiting for the school bus that pulls up right there. How long should the driverless car wait? And might someone bully such cars by teasing them that they are about to step off the curb–people don’t try that with human drivers as there will soon be repercussions, but driverless cars doing any percussioning will just not be acceptable. Since there are no current ways that driverless cars can give social signals to people, beyond inching forward to indicate that they want to go, how will they indicate to a person that they have seen them and it safe to cross in front of the car at a stop sign? Perhaps the cars will instead need to be 100% guaranteed to let people go. Otherwise without social interactions it would be like the case of the dark country road. In that case driverless cars would have a privileged position compared to cars with human drivers and pedestrians. That is not going to endear them to the residents. I don’t think we’ve even begun to consider how pedestrians and self-driving vehicles are going to interact. All the focus has been on getting the vehicles to navigate themselves, which is a tiny part of driving a car. I wrote a piece a few days ago about how the Meitu app asked for a bunch of permissions in ways that might concern people, but which were not actually any worse than many other apps. The fact that Android makes it so easy for apps to obtain data that’s personally identifiable is of concern, but in the absence of another stable device identifier this is the sort of thing that capitalism is inherently going to end up making use of. Fundamentally, this is Google’s problem to fix. Around the same time, Kaspersky, the Russian anti-virus company, wrote a blog post that warned people about this specific app. It was framed somewhat misleadingly – “reading, deleting and modifying the data in your phone’s memory” would probably be interpreted by most people as something other than “the ability to modify data on your phone’s external storage”, although it ends with some reasonable advice that users should ask why an app requires some permissions. talking about application permissions is difficult and we don’t have the language to explain to users what our apps are doing and why they’re doing it, and Google are still falling far short of where they should be in terms of making this transparent to users. Amid the pomp, red baseball caps and star-studded roster of entertainers at President Donald Trump’s inauguration, it’s been all too easy to overlook the unpredictable interplay of politics and energy markets. Luckily, Wyoming is here to remind us. Two Republican state senators are sponsoring a bill that would penalize Wyoming’s utilities if they sell power generated from utility-scale wind or solar installations within the state. If passed, any utility doing so after 2019 would incur a penalty of $10 per megawatt hour, which equates to about 12% of Wyoming’s average retail electricity price. Apart from its stunning vistas, Wyoming is known as a coal state (one of the bill’s sponsors represents a place called Carbon County, among others). Some 40% of U.S. coal is mined in Wyoming, which sits atop the Powder River Basin, and almost 90% of the state’s electricity derives from burning the stuff. So the local economy has suffered as prices of coal and natural gas – Wyoming also produces a lot of that – have collapsed: GDP fell more than 8% between 2014 and mid-2016, with more than two-thirds of that decline related to the mining sector (which includes gas production). Utter madness. Wyoming generates about 8% of its electricity from wind, and those senators want to penalise it for doing so? The report, from premium publisher trade body Digital Content Next (DCN), claims that the (mean) average premium publisher generated $7.7 million in revenue from distributing their content on third-party platforms in the first half of 2016 — equivalent to around 14% of their overall revenues in the period. DCN commissioned Powers Media & Entertainment Consulting to collect data and survey 19 of its members — including The Financial Times, ESPN, Bloomberg, NBC, and The New York Times — about the way they use and generate revenue from third-party distribution platforms. It then conducted in-depth interviews with eight of those members. The report did not offer financial details for each publisher, but instead provided the average amount a typical premium publisher receives. It’s not a great deal, and there’s equivocation around many of them. China’s Ministry of Industry and Information Technology yesterday announced a major crackdown on VPN (virtual private network) services that encrypt Internet traffic and let residents access websites blocked by the country’s so-called Great Firewall. The ministry “said that all special cable and VPN services on the mainland needed to obtain prior government approval—a move making most VPN service providers in the country of 730 million Internet users illegal,” reported the South China Morning Post, a major newspaper in Hong Kong. China’s announcement said the country’s Internet service market “has signs of disordered development that requires urgent regulation and governance” and that the crackdown is needed to “strengthen cyberspace information security management,” according to the Post. The government said its crackdown would begin immediately and run until March 31, 2018. The chatroom’s admins have instructed users to make fake Facebook accounts that are “ideally young, cute girl, gay, Jew, basically anyone who isn’t supposed to be pro-[FN].” Users are then instructed to lock down these dummy accounts so no one can tell they’re fake. Once they have their fake Facebook profiles, they’re told to infiltrate the comment sections of large French Facebook pages and post pro-FN memes and jokes about François Fillon, France’s current frontrunner for the presidency. And they’re doing something similar on Twitter, creating dozens of French-appearing sock puppet accounts. They then collect all of them on lists and organize campaigns to make things trend in French. Though they might only be Trump supporters in passing – what if they just love destabilising stuff? Qualcomm’s licensing model was simple. It charged a percentage of the total cost of all components in the phone. This approach had advantages for everyone involved. It meant licensees and Qualcomm didn’t have to scrap over which parts of the phone did or didn’t use Qualcomm technology, so they could just go ahead and focus on the more important task of developing and selling these hip new gadgets. Qualcomm’s argument was that no matter what went in the phones, they wouldn’t work at all without its technology.Twenty years later, the industry has moved on. Qualcomm hasn’t. Displays, cameras, memory and even metal casings have become increasingly more expensive components of a phone, yet Qualcomm still expects to collect a “tax” on all of it no matter how much it contributes. According to iSuppli, Apple’s iPhone 7 has total component costs of $219.80 for the model with 32 gigabytes of storage. Assuming a licensing fee of 5 percent, Qualcomm receives $11 for every model Apple sells regardless of the fact that three of the most expensive items are the display (which Qualcomm doesn’t make), the Apple-designed processor and the radio chips whose suppliers include Intel Corp., Broadcom Corp. and Skyworks Solutions Inc. If Apple were to increase the storage to 128 gigabytes, Qualcomm’s revenue would increase accordingly despite the fact that it doesn’t even make storage chips. Increase the display size (and thus the cost), Qualcomm collects. A better camera: You guessed it, more money to Qualcomm. The odd thing is that Apple went to war with Motorola over the same thing. I guess the difference is that Motorola didn’t make any components – it just owned the patents. A couple days ago I wrote a piece about the HTC U Ultra, wondering why HTC would release a Snapdragon 821 phone in 2017 when the rumor has LG and Samsung dropping Snapdragon 835 flagships in as little as a month. Well, I’ve spoken to some industry insiders in Asia today and I must apologize to HTC, because it would appear that the 835 is out of their reach until after April, so they couldn’t have used the 835 without drastically delaying the phone. In fact, that’s the case with almost all phones, including LG’s flagship. Yup, I have confirmed with an industry insider that the LG G6 will run on Snapdragon 821 instead of the 835 that everyone’s expecting. The reason? Samsung has first dibs. “The Snapdragon 835 won’t be available in large quantities until after the Galaxy S8 launches,” the source told me. I guess this shouldn’t really be this big of a surprise, since Samsung is helping Qualcomm build the chip. Apparently, the 835 won’t be widely available until after the release of the Galaxy S8, which I’ve been told by the same source will be April 14 in South Korea. Reminiscent of Apple cornering the market first in tiny hard drives for the iPod, and then for flash memory for the iPod nano.